It may also include other types of more technical information such as subscribers / users’ IP addresses, user IDs, meta-data, but only when this information can identify you as an individual. Personal information that is aggregated and cannot be associated with an identifiable individual is not considered to be personal information. We collect most of our information about you directly from you, with your consent when required by law. For example, when you take a test drive, online request an appointment or vehicle quote, purchase or lease a vehicle, or service your vehicle, Howard Carter Lease Ltd will collect information about you. We may also conduct contests, quizzes, surveys, promotions and offer several forms of personalized services such as vehicle warranty, servicing and maintenance and OnStar services, in respect of which you may be requested to provide personal information, such as name, mailing address, telephone number, e-mail address, age and other information that may be required to provide or administer these services or promotions. If you have applied for employment with Howard Carter Lease Ltd, the personal information submitted with your job application will be used for recruitment and other customary human resources purposes. For example, we may send you information about new job opportunities within Howard Carter Lease Ltd as well as other career development resources. Howard Carter Lease Ltd obtains consent from the individuals concerned for the collection, use or disclosure of personal information through various means: orally or through written documents, including agreements, forms including vehicle purchase / leasing forms and repair orders, welcome kits as well as printed or electronic communications. The form of consent sought by Howard Carter Lease Ltd will vary according to the sensitivity of the personal information, the reasonable expectations of the individuals and any requirements or standards established by law. Consent may be withdrawn at any time, subject to legal or contractual restrictions and reasonable notice; however, without such consent, Howard Carter Lease Ltd may be limited in the services or products it is able to provide customers. You may decide that you prefer Howard Carter Lease Ltd not to use your personal information to promote new and / or additional products and services which may be of interest to you and refuse further Howard Carter Lease Ltd contact by mail or telephone for marketing purposes or by email or telephone for quality control purposes. If this is the case, you may advise us by contacting customer service or contacting us using the information detailed in the ‘How to Contact Us’ section below. You can always limit the communications that Howard Carter Lease Ltd sends to you. To opt-out of commercial emails, simply click the link labeled “unsubscribe” or “opt-out” at the bottom of any commercial electronic communication we send you. Please note that even if you opt-out of promotional communications, we may still need to contact you with important information about your account or for other purposes as may be permitted or required under applicable laws. We may hire service providers, which may be affiliates, to perform services on our behalf. This may include, without limitation, a person or an organization retained by Howard Carter Lease Ltd to perform work on its behalf. We provide them with a limited amount of information which is necessary in order for them to provide the services required. They are prohibited from using the information for purposes other than to facilitate and carry out the services they have been engaged to provide. These service providers are not permitted to disclose this information to others. From time to time, Howard Carter Lease Ltd may be compelled to disclose personal information in response to a law, regulation, court order, subpoena, valid demand, search warrant, government investigation or other legally valid request or enquiry. We may also disclose information to our accountants, auditors, agents and lawyers in connection with the enforcement or protection of our legal rights. When you visit our website, we may use electronic means such as cookies to collect technical information. This information may include information about your visit to our website, including the IP address of your computer and which browser you used to view our website, your operating system, resolution of screen, location, language settings in browsers, the site you came from, keywords searched (if arriving from a search engine), the number of page views, information you entered, advertisements you have seen, etc. This data is used to measure and improve the effectiveness of our website or enhance the experience for our customers. For instance, it may be used to ensure that the products advertised on our website are available in your area or that we are not showing you the same ads repeatedly. We treat this information as personal information when it is associated with your account or contact information. We may use Google AdWords Remarketing to advertise Howard Carter Lease Ltd across the Internet and to advertise on third party websites (including Google) to previous visitors to our website. AdWords remarketing will display ads to you based on what parts of the DEALER website you have viewed by placing a cookie on your web browser. It could mean that we advertise to previous visitors who haven’t completed a task on our site or this could be in the form of an advertisement on the Google search results page, or a site in the Google Display Network. This cookie does not in any way identify you or give access to your computer or mobile device. The cookie is only used to indicate to other websites that you have visited a particular page on our website, so that they may show you ads relating to that page. If you do not wish to participate in our Google AdWords Remarketing, you can opt out by visiting >Google’s Ads Preferences Manager. 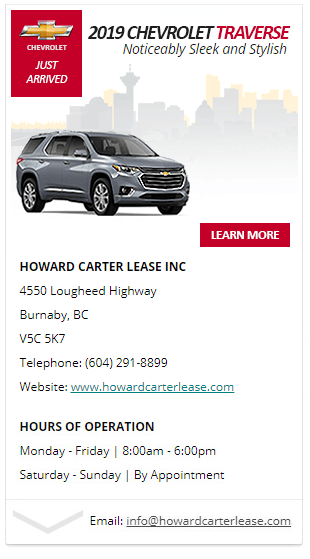 Howard Carter Lease Ltd does not allow third party cookies on its website for purposes of delivering third parties advertising based on preferences or interests known or inferred from the data collected for advertising purposes (often referred to as Online Behavioral Advertising or OBA). Additionally, you can disable or delete similar data used by browser add-ons, by changing the add-on’s settings or visiting the website of its manufacturer. You can also generally opt-out of receiving personalized ads from third party advertisers and ad networks who are members of the Digital Advertising Alliance of Canada. Please visit the DAAC opt-out page for more information. In some cases, personal information that we manage may be transferred, processed and stored outside Canada, and therefore may be available to government authorities under lawful orders and laws applicable outside of Canada. Howard Carter Lease Ltd will strive to protect personal information disclosed to third parties by contractual agreements requiring that those third parties adhere to confidentiality and security procedures and protections that are, at a minimum, equivalent to those employed by Howard Carter Lease Ltd itself. We will use reasonable security measures to protect your personal information against unauthorized access. Howard Carter Lease Ltd has implemented security measures that contain administrative, technical and physical controls that are designed to safeguard your personal information. Personal information will be retained only as long as necessary for the fulfillment of the purposes for which it was collected and for which consent was received, unless otherwise required or permitted by law. Personal information that is no longer required to fulfill the identified purposes or for a purpose required or permitted by law, will be destroyed, erased or made anonymous. Howard Carter Lease Ltd has developed and implemented retention procedures, and will ensure destruction of personal information in a method that prevents improper access. Howard Carter Lease Ltd respects your right to access and correct your personal information. If you need assistance updating your personal information, please contact us using the contact information detailed in the ‘How to Contact Us’ section below.